No one likes to think of the possibility that some day, easy tasks that we take for granted may prove beyond our ability. Things like the simple math we use to figure out a tip or balance our checkbook may become more difficult. I was surprised to learn that even the healthiest of brains can struggle with basic math and financial decisions as we get older. The issue isn’t intelligence, but age. 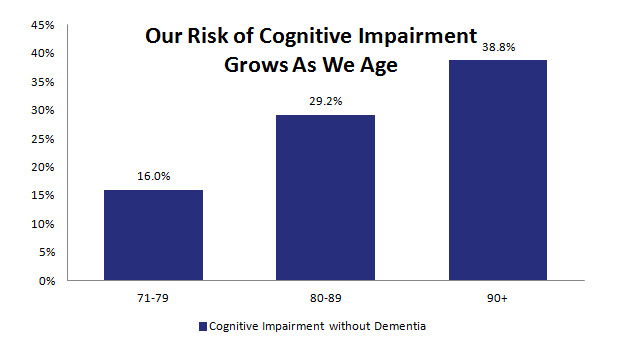 Once we hit 80, we all face a greater risk of some cognitive impairment. As a result, we’ll put at risk our financial success and well being if we don’t take steps early on to protect ourselves. This issue is most definitely a part of the transition process I introduced in the March newsletter. We have a choice, both as an older parent or as an aging child. We can take steps now to make use of financial tools that will protect us, like revocable living trusts, durable financial power of attorney, and health care directives. Or, we can pretend this will never happen, and do nothing. Clearly, I recommend everyone do the former. The reality is that as we age, we may continue to have good physical health. We may even continue to enjoy our daily crossword puzzle. But we need to recognize that age can make us more vulnerable to bad financial decisions. You haven’t worked this hard and this long to build up your wealth for nothing. But protecting it may require admitting we’re human. Things will change, and one of those things is that we may need more direct help with our finances. At 80 years old, he married a woman 17 years his junior, who, over their three-year union, according to the family, cashed $40,000 in blank checks sent by his credit-card issuer and emptied the contents of his $123,000 annuity, leaving him with little more than a giant tax bill. Luckily, the family learned what was happening before paperwork for a reverse mortgage could be submitted. Mr. Taylor still has the equity in his home. But this situation represents the last thing I want to happen to any of you. In this instance, it was a second spouse, but it just as easily could have been a friend or another family member. The sooner we recognize our potential risk, the better we can lay the groundwork to have our affairs taken care of the way we want. It may not happen today, but if you haven’t already done so, I suggest you set a date to finalize a transition plan. Have the conversation with everyone involved from friends and family to the professionals you work with. Make sure that everyone knows about everyone else so there’s a clear system of checks and balances in place. I’m of the firm belief that when we reach the point where we need help, that help doesn’t have to be smothering or condescending. If we’ve taken the time to create a transition plan that fits us, that respects our desires, we can have confidence that all the hard work we’ve done over the years won’t be lost in our last years.